Do you want to find out about your ancestors in Kloestitz, Bessarabia? To make this easier, I would like to provide for their descendants and for the interested public the results of many years spent on genealogic research concerning Kloestitz settlers, their ancestors, and descendants. The main focus of the data is the period between the settlement in Kloestitz in the year 1815, and resettlement, in 1940. Many ancestory-lines before 1815 have also been tracked; and resettlers to Germany in 1940 of my own family and their descendants have been tracked until now. tern boundary of the region. Containing 44,000 sq. km, Bessarabia is a little larger than the Netherlands in Europe. The German settlers and their descendants cultivated nearly 10% of the region’s land. Since the end of the Middle Ages, Bessarabia has been part of the Principality of Moldova, the Ottoman Empire, Russia, Romania, and the Soviet Union. The region got its name from the house of the Walach princes, the Bassarab, which had ruled Bessarabia in the 14th century. Today, the northern part of Bessarabia belongs to Moldova, and the southern part to the Ukraine. Southern Bessarabia had been the main settlement-area of the German emigrants. The village of Kloestitz was situated in this part of the region, in direct distance of approximately 1,500 km from the home villages of the settlers or their ancestors in the southwestern German principalities of Wuerttemberg, Baden, and the Palatinate; and around 1,000 km away from the way stations of a great deal of southwest German emigrants in the former Prussian provinces of West-, South- and New-East-Prussia (the latter two constituted from 1807-1815 the best part of the Duchy of Warsaw). From here, many of the southwest German emigrants as well as folk who had settled in this region in the first half of the 18th century, and local folk, followed the call and the promises of the Russian emperor, Tsar Alexander I, to resettle to Bessarabia, which, since 1812, had been part of the Russian Empire. About 2,100-2,500 families of German origin, that is 8,500-10,000 persons, for the most part of Protestant religious background, settled between 1814 and 1842 in Bessarabia; two-thirds of them during the first years form 1814-1817, among them also the Kloestitz settlers. At the beginning of the settlement, 1814, the Russian emperor provided for the German colonists on 16 plots of land almost 370,000 acre steppe-land to cultivate, that is 42 acre per capita. Until the end of the period of settlement in 1842 the colonists founded 25 so-called "mother-colonies." The region west of the German settlement-areas toward the river Prut was colonized by Bulgarian settlers, who had been granted the same conditions and privileges of settlement as the German colonists. In the north and east of the German settlement-areas the Russian emperor provided, for one thing, land to peasants under his direct rule, so-called "crown-peasants," who had to settle with reduced terms and privileges of settlement. And second, he gave large estates in the order of 2,500 to 25,000 acres to Russian dignitaries as well as to some Russian officials of German descent. 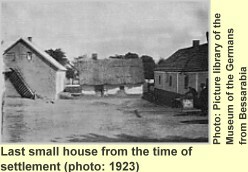 Despite the emigration of about 25,000 persons from the German settlement-areas, mainly between 1874 and 1927—the best part of them emigrated to the United States—the descendants of the German colonists were keen, on account of their high birth rate, and also in order to develop economically, to buy or lease additional expanses of land a nd to establish on them the so-called "daughter-colonies." As a result of this, a number of 125 "daughter-colonies" had been founded on bought or leased Russian- or German-owned estates from the 1860s on until the start of the First World War. A great deal of them had, in contrast to the "mother-colonies," only a couple of hundred inhabitants at most. They had been founded by financially strong farmers of the old colonies, who bought or leased ample of land to cultivate it with state-of-the-art technology. For that reason, the standard of living in many of the "daughter-colonies" often surpassed that of the old more sluggish colonies. At the moment of resettlement in 1940, the number of German villages amouted to 150. An area of 865,000 acre of land was being cultivated by descendants of the first German settlers, that is a mere 10 acre per capita. Agriculture was still the main source of income at that time: even after five generations in Bessarabia, 80% of the descendants of the first German settlers earned their living in this sector. 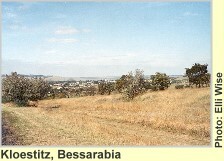 In general, the landscape of southern Bessarabia consists of wide and hilly steppe-land of the Budjak steppes. The Bessarabian soil (black-earth) is extraordinarily fertile on account of its high content of humus. The German settlers grew mainly cash crops for the export: grain, oil fruit and pulse. In the 1930s, the cultivation of maize alone amounted to 30% of the arable land. The cultivation of fruits and vegetables as well as the keeping of dairy cattle and sheep-breeding was also of importance. From the point of view of the Russian Emperor, the mode of cultivation employed by the German settlers was intended to serve as a model for the backward Russian agriculture of the time. The conversion of the Bessarabian steppe-land into a granary of the Russian Empire was the result of the cultivation by several generations of colonists of various descent—prominent among them the Germans. The export of the agricultural products of her southern steppes, including Bessarabia, to the cities of Western Europe via her newly seized ports on the Black Sea coast served as a means to further integrate Russia in the world-economy. The climate is continental: hot and dry in the summer, and cold in the winter. In the year 1815, Kloestitz was founded by 134 families of German settlers. Most of them had emigrated to Bessarabia—via year-long way-stations in Prussia—from their place of birth, or that of their ancestors, in Wuerttemberg, Baden, and the Palatinate; some had been native Prussians. In Kloestitz, generally, every family owned a farm inside the village on a plot of land 250 m long and 40 m wide. Behind the farmhouse and the barns, there was ample land for a big fruit and vegetable garden. All in all, the farm, and the fields outside of the village, comprised 160 acres. As early as 1859 the village already counted 1,334 inhabitants. Kloestitz had been part of the district of Akkerman (today: Bilhorod-Dnistrovskyy). It was located southeast from Borodino and east of Beresina (both were German colonies as well) on the western edge of a wide valley in the steppe on fertile soil. Form north to south, the river Tschaga flowed through the village. Provided that there was enough rain, the yield from the land was extraordinary, but very dry years could also lead to crop failures with severe consequences for the village folk. In 1818 Kloestitz got its Name "Kleastit." The temporary names of the village, "Emaut" and "Tscharga", had been replaced by order of the Russian government, which had the intention to rename all new villages in Bessarabia after the place names of major battles against Napoleon. Later the German spelling "Klöstitz" became custom. In the year of resettlement to Germany, 1940, the village of Kloestitz counted 717 families, and 3,212 inhabitants; except for 82 of them, all had been descendants of the first settlers. Today, Kloestitz's Ukrainian name is Veselz Dolina. I cannot guarantee the completeness and accuracy of my Kloestitz-Genealogic-Data, of the related geographical data, and of my account of historical facts; neither can I guarantee the validity of my interpretation of historical events, developments, and activities of involved persons. If you feel there might be major errors, or if you can propose ideas for improvement, click on Feedback and send me a short e-mail. And please take into account: This is work in progress. Commentaries concerning the state of development of this website as well as the provisional design of maps, diagrams, texts, and sites are written in deep red. The spelling of towns and villages is adapted to the customary use of their spelling today. The names of big cities and rivers are translated into English; the names of smaller towns and villages are used as they are used in the respective countries today, even if they have had, sometime in history, a German name as well. However, if it makes sense in a certain context, former German towns or villages in maps are shown with their German name; in cases like that, the german name is generally written in deep red. The information given in maps is presented in a similar way: generally, countries are drawn with frontiers as they are today. If it makes sense to emphasize former countries, states, provinces, etc. within frontiers as they have been sometime in history, they are drawn in deep red as well. The employed maps on this site certainly do not meet the cartographical standards and precision of publications like geographical- or historical atlasses. Because they are combinations of several maps with different kinds of projection and precision, slight deviations concerning the location of frontiers, rivers, and towns/villages are possible. Since this whole website is, primarily, not intended to meet scientific demands, I think, to keep things simple, there is no need for a big apparatus of references; they are given only in the case of some official documents, or quotations, or important information that is contradictory or controversial. This website is developed for the Internet Explorer 6.0 without recourse to any ambitious web-technology. Tests of this site with the browsers Netscape 7.1 and Mozilla 1.5 turned out to be successful as well. The administration of the Kloestitz-Genealogic-Data as well as the generation of html-files from it is performed by use of the database-application GES-2004 of Hans-W. Knoll Genealogy EDV Service. Many maps, diagrams, and photos, or certain areas in them, represent links to more detailed or enlarged accounts of the subject, or to picture-galleries. So please check maps, diagrams, and photos with your mouse. The webmaster, Hartmut Reule, is responsible for all the content on this website. This website is developed only for private or scientific purposes. Legal comment concerning links: The regional court of the city of Hamburg, Germany, has ruled that an included link on one’s own website could lead to a share of responsibility for content provided by the linked site (verdict from 05/12/1998). This could be averted if the owner of the website explicitly dissociates him-/herself form all possible content of the linked sites. For this reason I do dissociate myself explicitly form the content of all linked sites.